1. 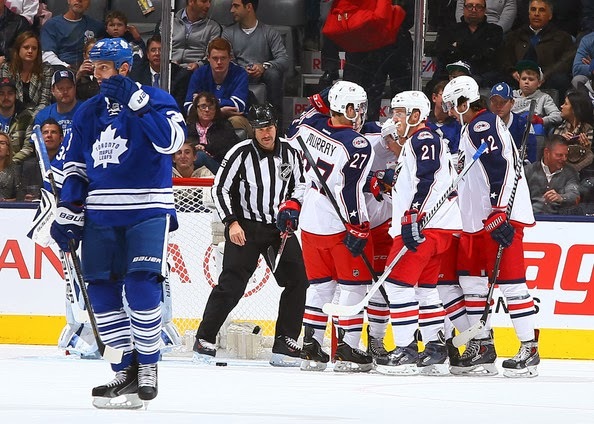 As if being blasted 6-0 by the Columbus Blue Jackets (who, by the way, had only three wins in their previous 12 games) wasn't bad enough, the Leafs followed that up by blowing a 4-1 lead that was punctuated with the team failing to register a single shot in the entire third period and overtime. The flaws that the Leafs have had on full display all season are finally catching up with them and it isn't pretty. 2. Toronto is now 28th in the league in shots per game with 26.1 and dead last in shots against per game with 36.1. The Leafs are about as good at creating and preventing chances as the Buffalo Sabres, a team headed straight for the draft lottery. The Leafs were once able to mask these deficiencies with elite goaltending and special teams, but both are starting to show cracks. 3. The second best short-handed unit last season, the Leafs have dropped all the way to 20th in the league this season after starting the year strong. A suspect penalty kill is made even worse because the Leafs are one of the most undisciplined teams in the league, averaging 16.3 minutes a game in penalties, bested (worsted?) only by the Flyers. That figure isn't inflated by their proclivity for punching either; the Leafs have taken 113 minor penalties on the year, second worst only next to Ottawa. Forcing a below average unit to kill that many short-handed minutes a night is a killer; not only does it give the opposition ample opportunity to score, but it keeps the best offensive players glued to the bench. 4. Luckily, the power play is still clicking, sitting second in the league. It better stay that way, because the Leafs aren't very good at scoring five-on-five, sitting 18th in the league with 41 tallies. Unfortunately, the Leafs don't get many opportunities with the man advantage; the Leafs have gone to the power play only 77 times this season, 27th in the league and only once more than Buffalo. The Leafs aren't being jobbed by the refs either, they simply don't have the puck enough to force the opposition into taking penalties. 5. The easy argument is that this is just a poor stretch by the team, made worse by the rash of injuries, most notably down the middle of the ice. This minor blip, however, has started after the Leafs' hot 6-1 start to the season. For more games than not, the Leafs had played poorly. That 6-1 start has made the Leafs' record look better than it really is. After those six games the Leafs have gone 8-8-2. Toronto is barely holding on. 6. It's a good thing the Eastern Conference is so terrible, because even after sputtering for weeks the Leafs are still in a playoff position, sitting sixth, five points up on Carolina. Man, what a terrible conference. 8. Oh, are we talking about Jake Gardiner? Add in the fact that he inexplicably scratches Gardiner (he of 20:15 average time on ice) and keeps in a guy like Mark Fraser (he of 14:26 average time on ice) who might be the worst Leaf defender at breaking it out of the zone, and you begin to understand why Carlyle is a mole taking down the Leafs from the inside. And let's not forget his love-in with Bozak, who is averaging 21:28 minutes a night, which is SEVENTH in the entire league. Bozak plays more minutes than Claude Giroux, Alex Ovechkin, Martin St. Louis, Pavel Datsyuk, John Tavares, and a whole host of other far superior players. Hell, on his own team he's playing more minutes than far superior players. 9. Here are a list of players who have been unable to play for Randy Carlyle at some point in their careers: Mikhail Grabovski, Clarke MacArthur, and Bobby Ryan. Not to mention Joffrey Lupul, and now Jake Gardiner. The three non-Leafs have a combined 61 points in 74 games this season. Aren't you glad Carlyle has so much say in the Leafs' decision making?